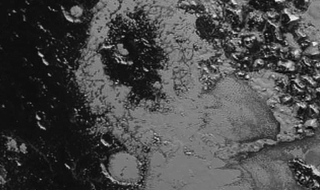 After all our confusion over Pluto’s strangely smooth and young terrain in the Tombaugh Regio, it’s almost a relief to start seeing craters in the latest close-up photos. In the latest image release, we’ve discovered a second mountain range in dark, old cratered terrain. The latest close-up from the New Horizons is a new release from the Pluto Flyby, when the probe raced just 77,000 kilometers (48,000 miles) past the dwarf planet on July 14, 2015. As with earlier close views into Tombaugh Regio, the distinctive light-coloured heart of Pluto, we can see features just one kilometer (0.5 miles) in diameter. While the Norgay Montes are a rugged range piercing 3.3 kilometers high, equivalent to Earth’s Rocky Mountains, the latest mountain range is a more sedate 1 to 1.5 kilometers (0.5 to 1 miles) tall. This is roughly equivalent to our Appalachian Mountains on the eastern seaboard of the United States. They’re 110 kilometers (68 miles) northwest of Norgay Montes, almost directly west of the Sputnik Planum of oddly bumpy plains. What’s most interesting about this new range is that we’re finally seeing the craters that have been oddly absent inside Tombaugh Regio. The lack of craters within the light heart is indicative of curiously young terrain freshly-resurfaced within the past 100 million years. In sharp contrast, these new cratered mountains look more on order of billions of years old, with layers of craters, some partially infilled with brighter material. Best of all, the distinction between light, smooth, young terrain Tombaugh Regio and this newly-photographed dark, cratered old terrain is sharply defined, lending credence to the idea that some active geological process is taking place within the heart. There is a pronounced difference in texture between the younger, frozen plains to the east and the dark, heavily-cratered terrain to the west. There’s a complex interaction going on between the bright and the dark materials that we’re still trying to understand.